As the tax deadline is approaching, the procrastinators out there are scrambling to get their receipts in order to file their income taxes. Yes, I am one of those procrastinators, but this year tax preparation has been easier than previous years. There have been years where my receipts were a mess and difficult to locate. This year was much easier due to the fact that I decided to get on the ball and finally got organized. This article will focus on how to make tax preparation much easier for next year. This will save you a bunch of time when you need to retrieve paperwork, like during tax season. Not only does it keep everything in one place, it keeps all the paperwork separated by topic. Investment Properties. If you have investment properties, there should be a file for each property. Expenses should be charged to each individual property. Retirement Accounts. Contributions, and tax records should be kept here. Note that you should receive a tax form from your brokerage at the beginning of the new year indicating your contribution amounts. Non Registered Accounts. Trade confirmations and tax records should be kept here. Non registered accounts are a bit trickier in that all trades/dividends/interest must be tabulated and reported to CRA. Home Office. If you have a home based business and have a designated home office, there are a few things to keep track of. You'll want to keep track of the mortgage interest, property tax, cable/internet/phone bills, insurance, power bills and office related purchases. A portion of these expenses can be claimed depending on how big the home office is relative to the size of the home. Other Business Expenses. For home based businesses, travel, dining out and other qualified business expenses can be claimed at year end. Vehicle. If you have a home business, you can claim a portion of your car usage that was for business. Keep your loan servicing, gas,maintenance, license/registration, and repair receipts here. Also keep a log of the KM's that you use for business as a percentage of total KM'S for the year. Charitable Donations. Keep all your charity receipts in one spot, as it will help if you decide to build up your receipt amount before making a claim. Remember that the first $200 donated receives a tax credit at the lowest marginal rate, everything after that is given a tax credit at the highest rate. Medical Expenses. If you have high medical expenses, it may be worth your while to gather all your medical expense receipts to get a few tax dollars back from the medical tax credit. Only amounts greater than $1,925 or 3% of net income (whichever is less) can be claimed. Note that private health insurance can be included as an expense, along with dentist visits and prescription eye glasses. Once you have filed taxes for the year, take all your receipts and store them in a labeled bankers box by year. You are required by CRA to keep your receipts for up to 7 years. If you have a home based business, then using a program like MS Money or Quicken can save you a lot of hassle if you keep close dibs on your income and expenses as they occur. At year end, you can simply print off all the applicable events which will give you a rough guideline as to what to expect from your filed receipts. How do you keep organized for tax season? Big brown bag for each item, black marker pen on the front of each stating the expense/income, all placed with an updated cover sheet in a large 50-75 litre rubber/plastic container. Fill as you go, taking the container to my account at tax time. Account does the work gives back the completed return (inside the conatiner) and the container is marked 2007, plaqce on a shelf in the basement. I don’t use a filing cabinet either, though I really should get one! I prefer the method of sticking all of my important papers on the top shelf of my cabinet and then sorting through them all when I get to my taxes… I’ve been meaning to organize them, but I just don’t ever get around to it. Probably because as soon as taxes are done I just go “oh I’ll do it next year”. I thought cra only needs last 6 years?? Peter, perhaps it is 6 yrs! I’ll have to check into that detail again. I use a new banker’s box every-year with the hanging file folders and get 20-30 folders each labelled according to the specific lines on the tax return. I add up all the receipts and forms for each folder and write the total for that line on the outside of the folder. I double check my addition and compare to the original number – of course if it is off, I will re-do it until I get it right. I normally put my receipts in the folders the day I get them (it becomes routine) and I keep the folders by my dresser so when I take my wallet out and empty my pockets, the receipts go right into the folders. The only hard part for me is keeping track of mileage for the car so I can figure out what percentage of my costs I can write off. I just can’t remember to always mark it down for business km’s at the time of the trip. I hate going to google maps or whatever and trying to reconcile my trips after the fact – what a pain! Preet, that is a great idea, to simply get a bankers box and put the files in there. That way, you don’t need to do the transfer from the filing cabinet to the bankers box every year. Wow, putting it all in a list that’s easy to follow makes filing taxes even scarier that it actually is. What is the deadline to file your taxes in Canada? It’s April 15 in US.. Does CRA accept electronic records, that is, if I scan all the documents and save them on media, can I get rid of all the paper? Should I be reviewed, I’ll print the material. Deadline is April 30 in Canada. I filed mine last night. 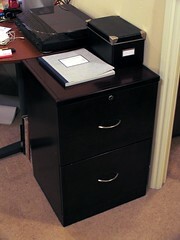 I acquired a 4 drawer filing cabinet last year and I absolutely love it. It keeps me much more organized as everything has a place and is easy to find any time I need it. I maintain a file or series of files for each category and when tax time comes, I just pull out the relevant “2007 Taxes” files and go to work. I have plenty of room in the cabinet now, so older files just get pushed down to lower drawers, but as the cabinet fills up, I’ll just toss the old overflow in to banker’s boxes. Luc, that should work fine for most documents. Just make sure you keep a good backup somewhere in case the media gets destroyed somehow. For taxes, I’ve always just used those Manilla 9″ x 12″ envelopes. Everything (RRSP slips, T4s, Notice of Assesments, GST Rebate forms, etc) goes into one of those envelopes where I write “Tax year 200x” in a Jiffy marker. Each month I put all my monthly bills (Power, Natural Gas, Telephone, etc) into one section of the file folder and at the end of the year I put those bills into another 9×12 envelope labeled “200x Bills”. Currently, I put those into an ‘accordian’ style file folder. However, there’s an empty small 2 drawyer file-folder sitting in a vacant room in my house. I’m thinking of getting some hanging file folders and just stuffing the contents of that accordian folder into the cabinet to protect against spills, etc, because “someone” has spilled beer into that folder one time. I have a scanner and scan every bill and receipt then I store them in the cabinet. After the my taxes are done, I store the old files in envelopes and that goes in a large box. I can find a receipt from 2 years ago in a matter of minutes. I can then print a copy if needed. I love that option since I use my platinum card to purchase everything and that gives me an extra year warranty. I may need to find a receipt 3 years from purchase and I don’t want to spend days looking for an old receipt. I’m with Daniel, but I’m still in the process of moving over to the new electronic system. I’m scanning the vast majority of my statements and such now, but I still have a box of old ones that I’d like to scan and shred. Question for you guys, does the IRS or CRA allow scanned copies in place of originals? I scan all invoices, bills & supporing documents into electronic files (pdf). It has been my experience that when the call comes in from Revenue Canada requesting back-up for any tax return, they will accept fax, photocopy and pdf emails of the originals. If there is a dispute or audit then be prepared to explain or show the originals. I have $16,800 in capital gains for 2008. So 50% of that is $8200 taxed at my marginal rate of 17.5% means capital gains taxes of $1435. I also can take a capital loss of $4800.So my question is … do I take 50% of that ($2400) and at my marginal rate of 17.5% = $420 and subtract that from the $2400? or do I subtract the $4800 from the $16800 and then do the calculations.Also how long do I have to sell for a capital loss. I’ve heard Dec.15th is the deadline.THANKS for any help. $8400 – $2400 = $6000 x 17.5% = $1050 tax payable. Note that it takes 3 days to settle your transaction, so if you sell, make sure to account for Christmas Holidays. I believe the final day to sell for the tax year is somewhere around Christmas Eve. Again, you should double check with an account to verify. Previous post: Ask the Readers: Giving Money as a Gift, How Much?